During my teenage years, Vladimir Bukovsky, Jacek Kuron, Leonid Plyushch and Adam Michnik were the people I admired the most. Along with them, I have been thinking about Jan Palach for the last few months. His tragic self-sacrifice on the 16th of January 1969 in Prague scarred me with an unfathomable feeling of sadness mixed with an immense admiration for his absolute refusal to accept the double-headed totalitarian and imperial oppression of the Soviets. A few years before, on the 11th of June 1963, the Buddhist monk Thich Quang Duc had burnt himself to death in Saigon in protest against the anti-Buddhist repression organised by the South Vietnamese president, the Catholic Diem. In 1975, after the seizure of Saigon by the communists, “22 monks, nuns and secular Buddhists” did the same thing “to call for religious freedom in Vietnam”. Closer to home, everyone remembers Mohamed Bouazizi’s self-immolation on the 17th of December 2010 in Ben Arous, Tunisia, which signalled the start of the Tunisian revolution calling for freedom and democracy. In a Tibet oppressed by a colonial and totalitarian power, about 40 Tibetans (including many monks and nuns) have died by self-immolation since March 2011, largely overlooked or unnoticed by the media, political classes and public opinion in our inward-looking democracies. They have names. I invite you to read them slowly as if reciting a mantra and reflect upon the mixture of emotions that you feel - whether compassion, solidarity, thought, admiration, gratitude, understanding or infinite sadness. nchok, Kelsang Wangchuk, Choephel, Kayang, Norbu Damdrul, Tenzin Wangmo, Dawa Tsering, Palden Choetso, Tenzin Phuntsog, Tsultrim, Tennyi, Sonam Wangyal, Lobsang Jamyang, Sonam Rabyang, Rigdzin Dorje, Tenzin Choedron, Lobsang Gyatso, Dhamchoe Sangpo, Nangdrol, Tsering Kyi, Gepey, Jamyang Palden, Losang Tsultrim, Sonam Thargyal, Lobsang Sherab, Chime Palden, Tenpa Thargyal, Choephak Kyab, Sonam, Rinchen, Dorjee Tsetin, Dargye, Rikyo, Janphel Yeshi and several others whose names we do not know. For their part, the Tibetan Government in Exile, faced with the violence of Beijing, struggle to break their habit of leaning towards self-censorship, a tendency rooted in decades of attempts at establishing a real dialogue aimed at opening Sino-Tibetan negotiations. It is useful to remember that they have been driven towards this consistently moderate approach, most notably by the governments of democratic countries who have conveniently persuaded themselves that economic reforms will inevitably lead China to shift towards democracy and the rule of law. Behind such moderation or self-censorship from the Tibetan Government in Exile, there is the question of nonviolence as an instrument of political struggle. This issue is even more difficult as the resonance of Buddhism – regarded as an essentially non-conflictual philosophy by the Tibetan religious leadership – leads to confusion between the moral values implied by nonviolence (i.e. a peaceable approach to human relations) and nonviolence as a method of political action. Such confusion between pacifism and nonviolence is fuelled by groups and organisations who, although claiming to be Gandhi followers, have, whether consciously or not, stripped Gandhian nonviolence of its political dimension in favour of other of the Mahatma’s more religious practices or life principles. A superficial approach to the question of nonviolence as a method of political action within the democratic world, including academic circles, has also contributed to this confusion. As a result, Tibetans in Tibet never had the occasion to be inspired by any kind of organised nonviolent movement led by Tibetan refugees in India, the US or Europe. Neither has the Tibetan Government in Exile ever provided examples of nonviolent actions to support their appeals. As cautious as the Tibetan Government in Exile should be about the sensitive issue of the Dalai Lama’s health and the potential question of his succession (which might lead to similar manipulations from Beijing as with the Panchen Lama’s succession), such cautiousness does not explain the lack of nonviolent political action from the Tibetan Government in Exile and worldwide supporters of freedom and democracy for Tibet and China. On the one hand, potentially emblematic nonviolent actions could have been possible, even by the Dalai Lama himself (whatever his closest advisors may have thought) and on the other hand, other members of the Tibetan Government and Parliament in Exile could have built upon their own notoriety and charisma in order to take charge of the movement, thereby reinforcing their own standing. These considerations do not apply to the Tibetans inside Tibet. In contrast to Gandhi’s confrontation with Britain, a country with longstanding democratic and lawful values – despite occasional slip-ups –, in the case of Tibet, the violence of Beijing’s oppression is such that it severely restricts the scope of nonviolent initiatives, as the merest breach – such as possession of a photograph of the Dalai Lama – provokes severe punishments. Nevertheless, it is in this context that nuns, monks and secular Buddhists (often very young) have for decades used only the weapon of nonviolence to confront the colonial and totalitarian power, for which they inevitably pay a heavy price. Numerous reports and personal accounts of survivors attest to years of imprisonment in inhuman conditions. However, the extreme diversity of these situations – a ferociously repressed Tibet on the one hand and a relatively supportive international public opinion open to the Tibetan cause on the other – should have provided an extra argument in favour of nonviolent activism in all democratic countries. This is all the more true since extremely courageous initiatives, which even had an impact in the West, have taken place in Tibet. We all remember the 1990 demonstrations in the streets of Lhasa by nuns who later became known as “the singing nuns” who were given heavy sentences which were extended after their resistance songs were illegally recorded in prison and listened to around the world. Furthermore, during the 1990s in Europe, the USA, Japan, India and elsewhere, nonviolent initiatives of solidarity started to occur – thousands of people fasted for the liberation of the Panchen Lama, hundreds of mayors flew the Tibetan flag on their town halls on the 10th of March, anniversary of the uprising in Lhasa, and significant demonstrations took place in several European capitals. However, this process soon ran out of steam. The most convincing explanation for the stifling of this growing activism should be looked for in the attempt by the Tibetan Government in Exile to reopen negotiations with Beijing, after the breaking off by the Chinese authorities, in 1993, of all official communication with Dharamsala. The Tibetan negotiators (led by Lodi Gyari, a distinguished intellectual representative of the Tibetan Government in Exile and one of the principal architects of the strategy of negotiation at all costs) had to, presumably, satisfy a precondition of the Chinese authorities: extinguish the fire of growing global protest or, at least do the utmost possible towards this end. In particular, the authorities in Beijing could not tolerate the use of the Tibetan flag in this growing activism as they saw it as a symbol of Tibet’s historical and political existence. From 1997 onwards, protests and actions started to lose momentum. The European demonstration in Geneva in March had only limited success; the campaign to fly Tibetan flags stagnated and parliamentary initiatives seemed to lead nowhere. In July 2000, the Tibetan authorities in exile welcomed with a polite silence the European Parliament’s resolution calling for international recognition of the Tibetan Government in Exile if, within a specified period, Sino-Tibetan negotiations failed to show significant progress. However, the dead-end of the Sino-Tibetan question cannot be boiled down only to this question of method. There are also certain fundamental issues to be resolved. Two of these are particularly unavoidable. Firstly, there is the issue of the future status of Tibet and its historical reality. If the Tibetan authorities in exile have claimed to be ready to accept a status of real autonomy for Tibet within China, they have always made it clear that it would be impossible to accept, due to it being untrue, that Tibet has always been part of China. As the Dalai Lama said: “We are not talking about independence. Hence if I talk only about a section of Tibet it will not be right. I am fighting for rights mentioned in the constitution [of China]. All of Tibet must be given equal rights in terms of culture and tradition.” The political implication of this “reminder” is obviously not without consequence. It underlines the fact that Tibet was effectively independent and that it was effectively invaded by China in 1950 and, even more problematic for China, it implies that an autonomous Tibet within China’s borders must be made up of the whole Tibetan territory and not merely the autonomous region of Tibet, as defined by the People’s Republic, which consists of only half of Tibetan territory. The second fundamental issue is that of the nature of the Chinese political system. China used to be a totalitarian regime but this has changed. After establishing its “ideological monopoly” and its “social monopoly” with the “Great Leap Forward” and even more so with the “Cultural Revolution”, the party, following Khrushchev’s example, took the opposite path to that taken by Stalin with the Gulag and the Great Purge – with Mao’s death, the subsequent elimination of the “Gang of Four” and the accession of Deng Xiaoping, the party moved from a system that penetrated the whole society to a policy of just controlling it and holding it in check. This is still where we are today. Whatever numerous Western observers say, China remains a totalitarian power. No opposition is tolerated. This does not mean that the party does not contain diehard reformers. We can all remember Hu Yaobang and Zhao Ziyang. But reformers were always eliminated or neutralised in the name of stability – the stability of China according to the communist elite, the stability of totalitarian power if the facts are examined. The recent eviction of Bo Xilai, a member of the Central Committee, has similar motives. Haunted by the spectre of the cultural revolution, the totalitarian power cannot tolerate a slip towards a populism which could lead to a situation whereby even the holders of power are no longer safe from possible purges or even from pure and simple elimination. When tackling the issue of Tibet, we should first ensure that we name things correctly. Some facts seem to indicate that things may be changing. In China, Internet users are defying censorship with imagination, caution and wit to denounce the totalitarian regime. In Dharamsala, the Dalai Lama claimed recently that “the People’s Republic of China’s ‘totalitarian, blind and unrealistic’ policies in Tibet were responsible for the ongoing wave of self-immolations in Tibet”. In Western economic circles, awareness is growing that China’s spectacular economic growth has failed to promote and settle the rule of law – in fact, much to the contrary. Numerous Western companies, having set up in China and now facing competition from local companies, are no longer considered necessary to the system and have become heavily discriminated against. As a result, many are considering pulling out. Even though it is not unanimously supported in Tibet and within the diaspora, we must continue – for the time being – to follow the Dalai Lama’s middle way approach, calling for: substantial autonomy for Tibet within its historic borders; the return to Tibet of the Dalai Lama and all Tibetan expatriates wanting to return; a massive reduction of the Chinese military presence in Tibet and an end to (Han) Chinese resettlement in Tibet. Whether the Chinese authorities like it or not, such a proposition from the Dalai Lama is not in line with political realism and a sense of compromise, which is significant in itself. It is also extremely generous: the leader of an invaded country which for sixty years has been occupied and brutally repressed, thereby leading to tens of thousands of deaths – a country which has been economically oppressed by the occupying power and whose culture and religion have been violently suppressed – agrees to be part, under certain conditions, of the occupying country! Such is the highly significant step made by the Tibetans towards Beijing. They have nothing to prove or to justify. All accusations of separatism, struggle for independence, dealings with foreign powers or counter-revolutionary conspiracy are not political arguments but reveal the utter hypocrisy traditionally used by communist regimes to disparage, deny, deceive, play for time and safeguard their power and privileges. Under such circumstances, a meeting of both parties would make no sense until Chinese authorities finally decide to also make a significant step and show a true willingness to engage in dialogue by incorporating all Tibetan territories that were annexed to the Chinese provinces of Qinghai, Sichuan, Yunnan and Gansu into the Tibet autonomous province. The Dalai Lama? How many divisions does he have? All communist regimes are violent – against the population suffering under them, obviously, but also at their core where, exempt from the possibility of being judged by free voters, political opponents or a free press, their members are free to resort to dogma, accusation and intimidation in order to destroy internal enemies. As totalitarian China has failed to move towards democracy and the rule of law, only the threat of a significant penalty in terms of image and global prestige could lead the Chinese authorities to change their views on Tibet. However, China’s communist rulers have long ceased to be impressed by Western leaders lecturing them – often just incidentally – about seeking dialogue and respecting human rights. Generally, communists in power sadly tend to show a strong front towards the weak – or, more precisely, those they deem weak. Chinese communists are no exception. For them, the Dalai Lama’s generosity and sense of compromise are but signs of weakness. They were wrong and they are still wrong. The Tibetans have already withstood the test of time. Their sense of identity has never been so strong. It only remains to organise this power of truth into a genuine Gandhian Satyagraha. If the objective is to achieve substantial autonomy for Tibet, a new drive must then be found – a new strength, a new course of action likely to make the Chinese authorities understand that compromise is also in their own interest. The only way forward that I can see is to start over again from the European Parliament’s resolution in 2000 calling for immediate recognition of the Tibetan Government in Exile. In order to avoid blackmail over investments or some similar kind of economic and political pressure (nothing new to Chinese leaders), it would be appropriate to promote the creation of a group of countries friendly to the Dalai Lama and Tibet, who would commit to jointly and simultaneously proceeding towards such a recognition. As well as the United States, Canada, Australia, the European Union and its 27 members states, it would be crucial to see India, Japan, Turkey, Brazil, South Africa, Argentina, Mexico and any other democratic country interested join the initiative. For sure, the Chinese authorities would be outraged. They would accuse us of intolerable interference in the affairs of a sovereign State, or even – for they do not mind their own contradictions – of imperialism. They have always used invective as a political tool. As usual, they will have the unconditional support of those great minds who still think that “it is aberrant to describe as an invasion (of Tibet) an event which, in 1959, was part of the Chinese revolution” and that the Dalai Lama’s project is “a theocratic, authoritarian, ethnicist, peace-threatening project”. We will have to carry on, undaunted. As the men and women who have set themselves on fire have tragically reminded us, time is of the essence. Banking on a democratisation of China, as desirable as it may be, would not be good enough. Beneficiaries of the totalitarian State are many. The economy is still largely (60%) in the hands of the State – i.e. the party and its 80 million members, with all kinds of payments and privileges involved. The military and other security forces are pampered by a totalitarian power, which, far from switching from the “rule of the party” to the “rule of law”, seems to be moving towards the glorification of patriotism and tougher repression within the country. What should be done? And how? The objective is: real autonomy for Tibet. The strategy is: the recognition of the Tibetan Government in Exile. Which political tools should be used? No miracle should be expected. Systematic and steadfast efforts should be made to lead democratic countries to pass resolutions urging their respective governments to recognise the Tibetan Government in Exile, and to lead the European Commission to provide financial support to Radio Free Tibet – including the funding of a broadcast in Mandarin. A large-scale campaign should invite local councils in these countries to fly the Tibetan flag on a permanent basis until the Tibetan Government in Exile is finally recognised, to sponsor a Tibetan town or village, and to rename a square Tibet Square or a main road Tibet Avenue. Let us dream of Paris renaming the Place de la Concorde Place du Tibet, Brussels renaming Rue de la Loi – home of the European institutions and the Belgian government – Avenue du Tibet, and Rome renaming Via del Corso, the city’s main thoroughfare, Corso Tibet… Such gestures would be backed by “classical” nonviolent initiatives: demonstrations, sit-ins, gatherings, exhibitions, marches, fasting and hunger–strikes. This would be nothing new, if not for, significantly, the rallying of multiple forces into what Mahatma Gandhi called a satyagraha (a movement based on the force of truth) in the context of an international campaign coordinated by the Tibetan Government in Exile. It will be a long, arduous journey. Parliamentarians and ministers will need to be convinced that a portrait of the Dalai Lama and a khata ceremony are not enough. They will have to work hard, take risks and face criticisms of wasting time supporting what is seen as a lost cause. The Tibetan Government in Exile will no longer be able to just say: “Do what you can”. They will have to spell out their claims and ask for concrete support. This major challenge goes beyond the issue of Tibet: it is about forcing truth and law into the heart of a totalitarian power. Taking up this challenge would be a wonderful way of celebrating those who, by immolating themselves, try to let truth prevail. Jan Palach, born 11 August 1948, an economics student, committed self-immolation on 19 January 1969 as a protest against the invasion of his country by the Soviet Union. He died three days later. Another Czech student immolated himself: Jan Zajic, on 25 February 1969. A few months earlier, Ryszard Siwiec, a Polish teacher and father of five, had set himself on fire in Warsaw on 8 September 1968 to denounce Czechoslovakian “normalisation”. A few years later, on the 14th of May 1972, Romas Kalanta, a Lithuanian man, immolated himself in Kaunas as a protest against the suppression of the Lithuanian language and culture by the Soviet occupiers. Gendhun Choekyi Nyima was named the 11th Panchen Lama by the Dalai Lama on 14 May 1995. Three days later he and his family were reported missing. 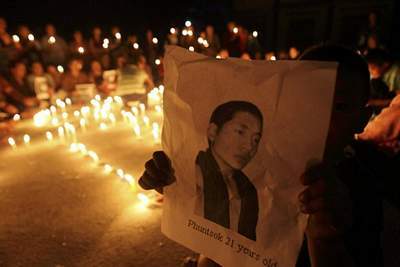 Only after one year had passed did the Chinese authorities admit they had been detaining the Panchen Lama “for his own safety”. About the complex issue of relations between Tibet and China, see the excellent work by Anne-Marie Blondeau and Katia Buffetrille “Le Tibet est-il chinois ?”, Albin Michel, Paris, 2002. Lobsang Sangay, the Kalon Tripa (Prime Minister in Exile), accepted the resignations of the Dalai Lama’s special envoys (to China) Lodi G. Gyari and Kelsang Gyaltsen, which came into effect on 1 June 2012. The Tibet autonomous Region spans over 471,600 sq mi and has a population of over 3 million Tibetans. Historical Tibet covers 965,000 sq mi and a population of 5 to 6 million Tibetans. The Khata is a scarf which traditionally symbolises happiness and compassion. It is usually white and made of silk in Tibetan culture. When offered to a lama, it is offered back.